Steve was raised in Mobile, Alabama just off (Fulton Road) Dauphin Island Parkway, near Mobile Bay and not far from Dog River. He attended B. C. Rain High School for two years, prior to his family’s move to Blue Ridge, Alabama. He graduated from Wetumpka High School In 1969. Steve later attended Ringling College of Art and Design in Sarasota, Florida, graduating with honors in 1972. He now lives in Blue Ridge, Alabama with his wife Deb and three pets, Pearl, Coqui, and a crazy cat, Maui. Steve enjoyed a 37 year career as a Professional Illustrator, serving 20 years as Senior Illustrator and Art Director in publishing. Steve is a signature member of the Watercolor Society of Alabama, Georgia Watercolor Society, Southern Watercolor Society, and the International Society of Acrylic Painters. 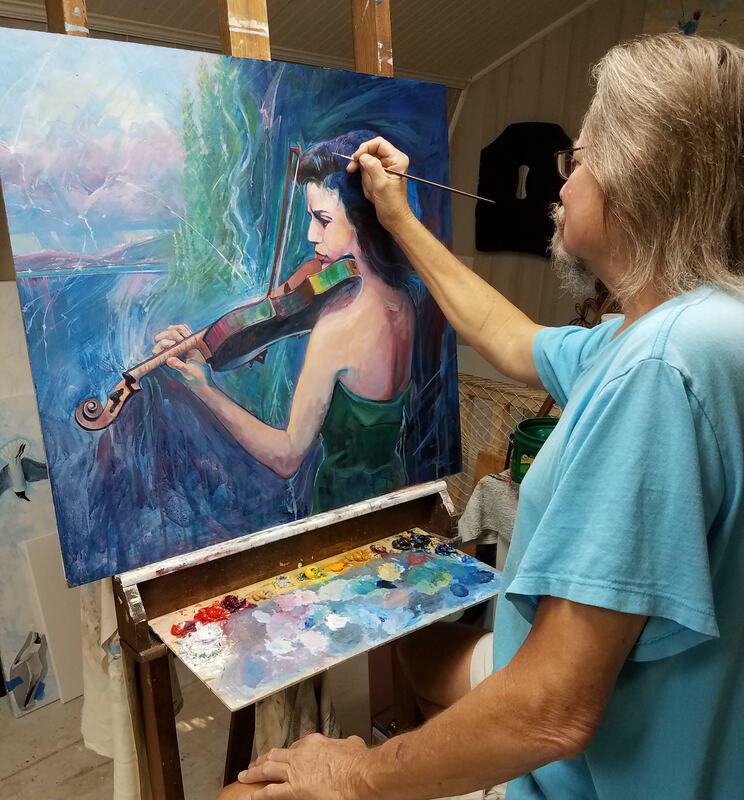 Steve and his wife Deb were the first married couple to be juried into an ISAP competition at the same time and the first married couple to receive Signature status with the International Society of Acrylic Painters. Steve’s awards include winning the 1990-91 Alabama Migratory Waterfowl Stamp Competition; $500.00 Fine Art Supply prize from the International Society of Acrylic Painters in Santa Cruz, CA; Elmore County Art Guild Best of Show Award; Best of Show Prattauga Art Guild; Best of Category ( Watercolor) Montgomery Art Guild; and the Watercolor Society of Alabama Merit Award #1.